The notion of addressing bad health and promoting good health among people with learning disabilities is relatively new. Concepts of 'normalization' of services, integration of people into local communities and providing an 'inclusive' (rather than exclusive) ethos for care have led to the understanding that people with learning disabilities have the right to be treated with the same respect as everyone else. Recognition of their spiritual, legal, political, and sexual rights has therefore been near the top of the agenda for some time now. The last piece in the jigsaw is recognition of their right to live long and healthy lives - the subject of this book. Concepts of Health. 2. Influences on Health. 3. 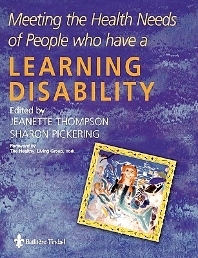 Health needs and people who have a learning disability. 4. Health promotion a strategy for meeting the health needs of people who have a learning disability. 5. Accessing health information. 6. Policy and legislative framework. 7. New public health agenda. 8. Analysis of need. 9. Self value and self worth. 10. Physical health needs. 11. Sexual health. 12. Mental health. 13. Transitions. 14. Valued occupation. 15. Working withcarers. 16. Working with communities. 17. Inter professional and multi agency working.